If we ever make our way back to Argentina, there are a handful of things we are going to gorge ourselves upon. 1. Grass-fed Argentine beef. We grew up around cattle operations and the beef industry, but the best beef we’ve ever put in our mouths was in Argentina. Hands down. 2. The garlic-butter sauteed calamari at Broccolino’s in Buenos Aires. 3. The honey-glazed medialunas (flaky, tiny croissants) at a hotel near Iguazu Falls. 4. Anything from Francis Mallman’s restaurants. 5. Mate – A hot beverage that is brewed much like tea using the leaves of yerba mate, is more prolific in its consumption than Starbuck’s and has a much more social element to it. 6. And last, but certainly not least, Alfajores. The subject of our recipe post today. In Argentina, the alfajor (Pronunciation: All-fah-whore) is probably the most consumed sweet/confection and, like American barbecue, varies from region to region. The entire country seems to have been raised on them. You’re born. You’re weened. An alfajor is shoved in one hand and a mate/guamba (the gourd/cup out of which one drinks mate) is placed in the other. A year or so later you eat your first kilo of medium-rare, grass-fed steak and you’re eligible for an Argentine passport. The exact origin of the alfajor is unknown, but it likely dates back to Spain’s occupation by the Moors. The word is derived from the Arabic word al-fakhur or alaju. The Spanish variant is different from those found in the Americas (which likely evolved after they were brought over in the hulls of ships as rations for Spanish soldiers post-1492). In Spain, it is usually cylindrical with a filling and is made from flour, almonds, honey and spices such as cinnamon. The Arab influence is obvious. 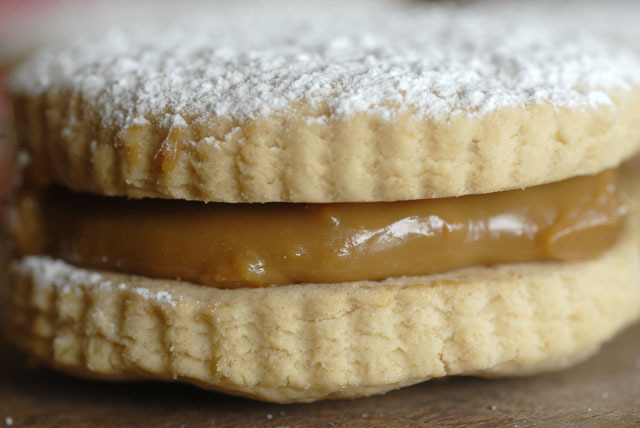 While there are several variations throughout Argentina (and South/Latin America in general), the most common may best be described as a layer of dulce de leche (gooey “milk candy”) that is sandwiched between two shortbread-esque cookies and coated in powder sugar. Every baker, grandma and cookie company claims theirs is the best – or even the original. Like so many other dishes that are a matter of national pride, there are a million variations and ways of eating them – though most of the purists we know say they must have dulce de leche between the cookies and that they are best once the cookie has had enough time to absorb the filling. Whether you get adventurous and roll them in coconut, coat them in chocolate, change the filling or otherwise set off on your own culinary journey, we’ll let you be the judge. Alfajores: Argentina’s best-known sweet. 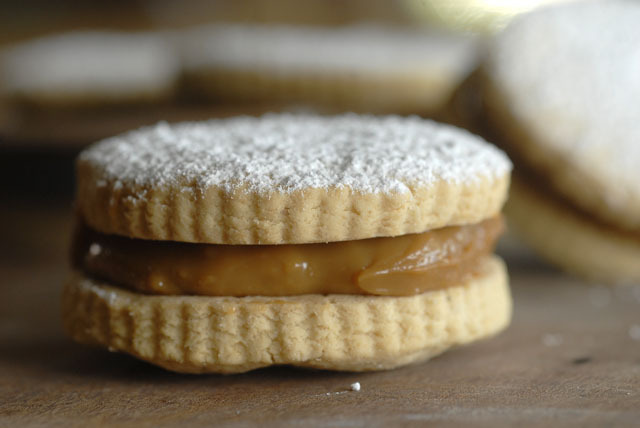 Dulce de leche (“Milk candy”) sandwiched between a pair of shortbread cookies. 1. Bring a pot of water to a boil. Drop can of sweetened condensed milk in pot and make sure water covers it by a couple of inches. Boil it for 3 hours. Remove. Allow to cool for 20-30 minutes. Remove lid (careful, hot liquid may ooze out). Remove contents to a container and reserve. Voila. Easy Dulce de leche. 2. Whisk all dry ingredients except sugar together and reserve. 4. Ad remainder of wet ingredients and mix until incorporated. 5. Turn your blender to “low” and gradually add/mix your dry ingredients until there are no dry white spots evident. 6. Turn dough onto plastic wrap, shape it into a disk, wrap and place in refrigerator until firm (1 hour or longer). 7. Preheat oven to 350 degrees. Prep a cookie sheet with parchment paper. 8. Remove dough from freezer. Unwrap. Place it on a lightly floured surface. Lightly sprinkle the top with flour. Roll it to quarter-inch thickness and stamp out 24 “cookies” (rerolling dough as necessary until it is all used). 9. Place cookies on prepared baking sheets and bake 12-14 minutes until cookies are pale gold on the bottom (the tops shouldn’t brown). 10. Remove from oven. Allow to come to room temperature. Flip half your cookies upside down and spread 2t of room temperature dulce de leche to them. Put a top on them and dust with powdered sugar. This entry was posted in Culinary, Food and tagged Alfajores, argentina, baked goods, comfort food, cookie, dessert, dulce de leche, recipe on July 10, 2015 by Out of Abilene.